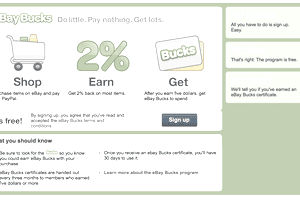 eBay Bucks is a rewards program that pays in a currency only redeemable on eBay. It's free to use, you get rewarded for buying things on eBay, and you don't need to pay any sign-up fee. Participants can earn up to $100 a month or a maximum of $500 a quarter and you'll receive your eBay Bucks every three months, at the end of each quarter. eBay Bucks is an established program created to reward eBay users for buying items on the site. You accumulate Bucks when you buy items with the qualifying logo. At the end of each quarter, users who have earned five or more dollars in rewards are sent an eBay Bucks reward certificate. The certificate can be redeemed on eBay to buy more items. eBay Bucks are only good on eBay.com. eBay Bucks is available for U.S. citizens, or anyone with a U.S. address connected to their eBay account. All accounts must be in good standing and not under suspension for a violation or nonpayment of fees. Users must be registered on eBay.com. Also, users must have a valid PayPal account that is in good standing. eBay UK members can sign up for a similar program called Nectar. There is a limit of only one eBay Bucks account per person. Members can sign up for free here. This means you'll get no eBay bucks for money spent on shipping, taxes or any other money spent aside from the item's purchase price. "eBay reserves the right to change the base earn percentage up or down. From time to time, eBay may offer special promotions that would provide members with extra eBay Bucks or an additional earn percentage in addition to the base earn percentage for qualifying purchases during the promotion period. If your purchase qualifies for multiple promotions, you will automatically earn credit for the highest value promotional offer." eBay users can earn a maximum of $100 on any single purchase. For example, if the base percentage is 1 percent, and the item price is $12,000, the maximum eBay Bucks that can be earned for that single purchase is still $100. eBay allows a maximum of $500 in rewards per calendar quarter. This is called a quarterly earn limit. The maximum amount of purchases to earn this reward is $50,000 per quarter. Purchases beyond $50,000 will not qualify for eBay Bucks rewards. eBay Bucks certificates are issued about 15 days after the end of the quarter in which they were earned. In every member's "My eBay" is a section where the eBay Bucks certificates will appear. eBay also sends an email when the certificate has been uploaded and is available for redemption. When you are ready to redeem your eBay Bucks, a special section will appear at checkout on eBay. The eBay Bucks can be applied to purchases at the seller's discretion. Remember, eBay Bucks can't be used in all categories, so do the research first before deciding how to use eBay Bucks. "eBay reserves the right to modify or terminate this Program at any time by posting amended terms or a termination notice on the Eligible Participant's 'eBay Bucks' section within My eBay or by sending email notice to the email addresses tied to Eligible Participants' eBay accounts. Except where stated otherwise, all amended terms will be effective three (3) days after they are posted and/or emailed to you. If any modification is unacceptable to you, your only recourse is to opt out of the Program by going to the eBay Bucks page in 'My eBay' and follow the link 'Want to unenroll from eBay Bucks?' located under the 'Activity' table."